As much as I worship and love Stanley Kubricks original 2001, I don't know why it took me so long to get around to this one. What makes it even more bizarre (if you know me), is that I have an obsession with director Peter Hyams. He's hands-down one of my all-time favorite directors. He's incredibly talented and severely underrated as a genre director. He's given us some really, really great films, yet nobody ever bothers to remember who made them or what his name is. And really, that's a damn shame. But moving on. Not knowing exactly what to expect, I went in hopeful, knowing that Hyams has never really let me down before, though End of Days was pretty forgettable. But 2010 was made around the time where he was really on a creative high, knocking out solid work left and right. It also helps that slow science fiction is a personal favorite little sub-genre of mine. 2010 is a technical marvel. While the original film was groundbreaking for it's time, and still an incredible technical achievement today, 2010, while not breaking new ground with effects, does do a near flawless job in that department. The model work, matte painting, and practical effects are all integrated seamlessly into the live action shots, for a truly stunning piece of science fiction filmmaking. There were only really maybe a time or two where you can really notice that there was a blue screen involved for a particular shot. Considering this film was made in 1984, that's an achievement all on it's own. In terms of the film itself, it's incredible. Hyams story pulls you into the events that happened in the first film in a way that even if you haven't seen 2001, you will still be able to follow what's going on. Even when dealing with the events of the first film, writer/director Peter Hyams fleshes out those elements in a way that makes sense, which is really refreshing when you take into consideration that most people were endlessly confused or lost throughout most of Stanley Kubrick's original masterpiece. The cast is nothing short of phenomenal. Roy Scheider is such a treasure and highly underrated as an actor. It's a shame he doesn't get the recognition he deserves. Rounding out this stellar cast is John Lithgow, Helen Mirren, Bob Balaban, Douglas Rain returning as the voice of HAL, and a few other notable recognizable faces. The film does such a great job in trying to realistically explain HAL's behavior and actions in the first film, in effect allowing the story to move forward since HAL again is a big part of this new mission. It's plausible. But that doesn't keep the intensity from rearing it's ugly head, again. Hyams has a talent for building the tension up to a fever pitch, especially in the climax, that while he doesn't use the same technique's that Kubrick did, he does it in his own particular way that works just as effectively. I would definitely call this a sci-fi/thriller rather than a sci-fi/drama. 2010 is a worthy followup to a remarkable film. In it's own way, I found 2010 to be just as good. 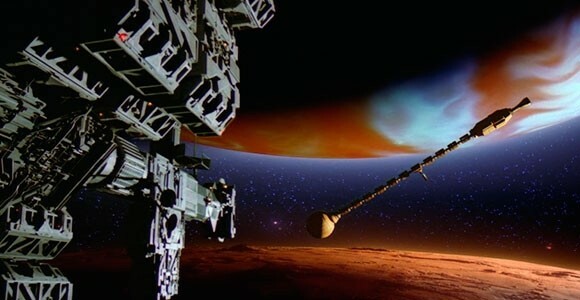 You can't judge any film by the standards that 2001: A Space Odyssey set, so in that regard, while some may agree and some may not, I think 2010: The Year We Make Contact is just as good as that film. You can't go in expecting the same kind of magic, because that's just not realistic. But Hyams being the amazing filmmaker he is, is able to make easily one of the best science fiction thrillers ever made, on a technical and cinematic level. It's a brilliant, beautiful, and highly enjoyable film that should get the same kind of respect that 2001 received. Before I purchased this Blu Ray, I did some digging into past reviews and comments on sites such as Amazon and was surprised to see that while many people hailed the film as a certified classic, a majority of them didn't think the Blu Ray was anything to get excited about. After purchasing it myself, I couldn't disagree more. While there are not many Special Features other than a short vintage featurette titled "2010: The Odyssey Continues" - while short, is a fascinating and informative look behind the scenes and the creative process - and a trailer, the transfer of the film itself is stunning. If you take into consideration that this was shot on film, some very slight graininess is expected. For me, this was only ever present and noticeable in the scenes inside the ship when the crew would be in the cockpit. But all of the space stuff and effects work were free of any of this. The darks were rich and black, and the colors were vivid. One of the things I was concerned with would be the composite shots in space utilizing the model work and other backdrops, matte paints and such to create a realistic sequence in space. Except for one minor scene where you can see the surrounding black that was overlaid onto an existing shot, it was flawless for the entirety of the film. So my fears were put to rest. The effects work, made even clearer in HD, were a gorgeous thing of wonder. I was simply in awe and enthralled at these amazing images. All the money that big studio's fork out for 100% CGI still, today, doesn't come close to the epic realism of model work, matte paintings and composite shots. I don't know when they'll get it in their heads that CGI is not always the best way to go. It may be easier, but it doesn't look better. If anything, 2010 is a testament to that; a film that was made in 1984. It's an absolute must buy. You can find it very cheap, usually under $10 with shipping included on eBay and Amazon. I don't know why I waited to so long to pick this up. Though short on Special Features, the transfer is just simply amazing and the film has never looked better. It's a remarkably vast improvement over the previous DVD release.